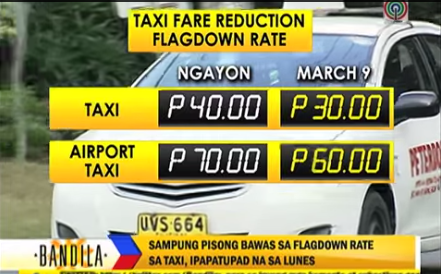 MANILA, Philippines - Starting Monday, March 9, 2015, provisional decrease in the flag-down rates for taxis and airport taxis nationwide will be implemented, the Land Transportation Franchising and Regulatory Board (LTFRB) officially announced recently. The P10 rollback in the flag-down rates will bring down the rate from P40 to P30 for regular taxis and from P70 to P60 for airport taxis. LTFRB Chairman Winston Ginez clarified that as the rollback is only provisional, taxi meters will not be recalibrated to reflect the new rates. As such, the meters would still show P40 (or P70 for airport taxis) as the initial fare. To apply the new provisional rates, taxi drivers would have to manually deduct P10 from the total fare. The LTFRB advised all passengers to take note of the new rates. The board also warned that taxi drivers who refuse to implement the rollback will be fined with P5,000. The LTFRB urged commuters to report taxi drivers who refused to acknowledge the P10 rollback to the agency’s number at 426-2515 or through 09214487777.